Game of Interest #1 Villanova Fairfield128LaxWP Game PageThis game had it all. A comeback (Villanova’s lowest win probability was hovering close to single digits in the 3rd quarter). It was a close game (neither team had more than a 2-goal lead until late). And it resulted in a fairly significant 37 point Lax-ELO transfer. What more could you want? The Wildcats responded after getting thumped by Maryland last weekend. You always look to see how a team responds after a game like that. Not that Villanova did a great job until the 4th quarter, but eventually, they got in gear.Tension Game Score: 61★ ★ ★The tension game score for this game was 61, which indicates an fairly close battle.Villanova Min. Win Probability: 12%★ ★The lowest win probability that Villanova had at any point during the game was 12%, which suggests that you would not fault those that switched over to something more compelling.Lax-ELO Points Transfer: 37★ ★The victory means a transfer of 37 Lax-ELO points from Fairfield to Villanova. As a result of this transfer (and the rest of the games played), Villanova moves from 36th to 31st nationally; Fairfield goes from 60th to 61st. 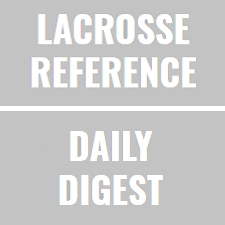 Game of Interest #2 Lehigh Navy158LaxWP Game PageTale of two halves in this one. We had a very tight contest for about 55% of this one. Navy was up 2 goals, with a roughly 80% chance to win after 33 minutes. Then Lehigh flipped a switch and went on a real tear. In the final 27 minutes, they outscored Navy 11-2. The key stat was a large increase in their shooting percentage from 21% to 48%. As you might imagine, they did most things better during that 11-2 run than before, but that was the key stat. Tension Game Score: 96★The tension game score for this game was 96, which means that it was not a very tight affair for the most part.Lehigh Min. Win Probability: 17%★ ★The lowest win probability that Lehigh had at any point during the game was 17%, which suggests that you would not fault those that switched over to something more compelling.Lax-ELO Points Transfer: 50★ ★ ★The victory means a transfer of 50 Lax-ELO points from Navy to Lehigh. As a result of this transfer (and the rest of the games played), Lehigh moves from 20th to 12th nationally; Navy goes from 31st to 41st. Game of Interest #3 Towson Denver67LaxWP Game PageI wish I had these numbers handy (a new stat-tracking task, yay), but this had to be one of the slowest paced games of the year. Not that that is a bad thing; a good defensive battle means the goals are that much more exciting. Combined, Towson and Denver had just 69 possessions. Sub-70 possession games have been few and far between this season. Denver was the prime culprit (if you want to use that label). Their average possession was 61.7 seconds, on the strength of 1.3 shots per possession. Frankly, I’m still not sure what to make of the “shots-per-possession” metric. Denver backed up a lot of their misses, but they also ended up with a 42% turnover rate and a fairly low 21.2% efficiency rate. The high number of shots-per-possession meant that they had a significant time-of-possession advantage. But it also meant they only shot 16%. Which meant that the efficiency was low. I suspect that this metric needs context before it becomes super-useful.Tension Game Score: 44★ ★ ★The tension game score for this game was 44, which indicates an extremely close nail-biter.Denver Min. Win Probability: 19%★ ★The lowest win probability that Denver had at any point during the game was 19%, which suggests that you would not fault those that switched over to something more compelling.Lax-ELO Points Transfer: 5★The victory means a transfer of 5 Lax-ELO points from Towson to Denver. As a result of this transfer (and the rest of the games played), Towson moves from 13th to 15th nationally; Denver goes from 7th to 7th. Game of Interest #4 Penn Cornell1615LaxWP Game PageTension Game Score: 98★The tension game score for this game was 98, which means that it was not a very tight affair for the most part.Penn Min. Win Probability: 2%★ ★ ★The lowest win probability that Penn had at any point during the game was 2%, which means that this was a “happens-a-couple-times-a-year” type comeback.Lax-ELO Points Transfer: 18★The victory means a transfer of 18 Lax-ELO points from Cornell to Penn. As a result of this transfer (and the rest of the games played), Penn moves from 25th to 22nd nationally; Cornell goes from 9th to 10th. Game of Interest #5 Mercer VMI168LaxWP Game PageTension Game Score: 130★The tension game score for this game was 130, which means that it was not a very tight affair for the most part.Mercer Min. Win Probability: 35%★The lowest win probability that Mercer had at any point during the game was 35%, which means that while things never get truly dire, this was an uphill battle.Lax-ELO Points Transfer: 56★ ★ ★The victory means a transfer of 56 Lax-ELO points from VMI to Mercer. As a result of this transfer (and the rest of the games played), Mercer moves from 71st to 66th nationally; VMI goes from 68th to 71st.